Versatile carts are ideal for maintenance or stocking work. Heavy 14 ga. all welded steel construction for industrial service. 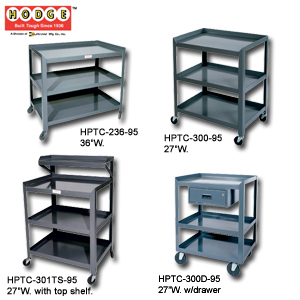 Special purpose carts improve efficiency. Top shelf has 1" lips on 3 sides. Cener and bottom shelves have 1-1/2" lips up. Rolls on bolt on 5" x 1-1/4" polyurethane casters, 2 swivel, 2 rigid. Welded drawer on units with "D" in Product No. Gray powder coat finish. FOB Shipping Point. Product No. Size W x D x H Drawer Wt. (lbs.) Price Ea.